Best of luck to the fundraisers from Cancer Research UK who are planning to create a Bluebell wood in Beacon Park. If you wish to make a donation, please follow this hyperlink. Lichfield District Council has assured the Park Friends Group that only native Bluebells will be planted. The Council has also given undertakings to the Heritage Lottery Fund, regarding the future management and maintenance of the park. In respect of the woodland the Council said it would "promote the development of [a] native broadleaved woodland by introducing a cycle of woodland management, and a process of thinning and removal of non-native species." The Common Bluebell is easily distinguishable from the Spanish Bluebell – refer to the images below. Lets hope the bulbs that will be planted have been sustainably sourced from a reputable supplier. There have been a number of occasions when cheap foreign bulbs have been imported and sold through garden centres. Why not visit Leomansley Wood to see the a magnificent display of Common Bluebells within an ancient woodland. Text below reproduced from Wikipedia. The Spanish Bluebell is distinguished from the Common Bluebell by its paler, larger blue flowers, more erect flower stem, broader leaves, blue anthers (where the Common Bluebell has creamy-white ones) and little or no scent compared to the strong fragrant scent of the northern species. 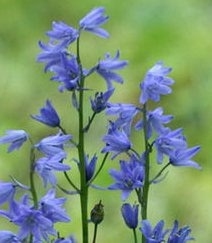 The Spanish Bluebell was introduced in the United Kingdom, where it has become an invasive species. 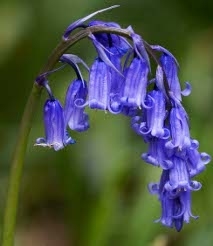 The two species hybridise freely, and the resulting hybrid and the Spanish Bluebell both produce highly fertile seed and can invade areas of the native Common Bluebell. This has caused the Common Bluebell to be viewed as a threatened species.